"formerly Alma-Ata, city, Kazakhstan, in the foothills of the Trans-Ili Alatau. A terminus of the Turkistan-Siberia RR, Almaty is the industrial and cultural center of Kazakhstan and was for many years its capital; in 1997 the capital of Kazakhstan was moved to Astana. Leading industries include fruit canning, meatpacking, tobacco processing, and the repair of railroad equipment. Most of the inhabitants are ethnic Russians, with Kazakhs the next largest group. The city was founded in 1854 as a Russian fort and trade center known as Verny. It has been repeatedly struck by earthquakes and mud slides during its long history. Almaty has a university and is the site of the Kazakh Academy of Sciences. To the east is Ile-Alatau National Park." From the Columbia Encyclopedia . "Russian Alma-Ata, formerly (1855-1921) Verny, city, southeastern Kazakstan. It was formerly the capital of the Kazakh S.S.R. (1929-91) and of independent Kazakstan (1991-97). Almaty lies in the northern foothills of the Trans-Ili Alatau at an elevation of 2,300-3,000 feet (700-900 m), where the Bolshaya and Malaya Almaatinka rivers emerge into the plain. The modern city was founded in 1854 when the Russians established the military fortification of Zailiyskoye (renamed Verny in 1855) on the site of the ancient settlement of Almaty, which had been destroyed by the Mongols in the 13th century. Cossacks, peasant settlers from European Russia, and Tatar merchants soon established themselves in the vicinity, and in 1867 the fortification became the town of Verny and the administrative centre of newly created Semirechye province of the governorate-general of Turkistan. By 1906 the population had grown to 27,000, two-thirds of whom were Russians and Ukrainians. Soviet rule was established in 1918." "In 1921 the city was renamed Alma-Ata, for its Kazak name, Almaty (literally "Father of Apples"), alluding to the many apple trees in the locality. The transfer of the Kazak capital from Kzyl-Orda (Kazak: Qyzylorda) to Alma-Ata in 1929 and the completion of the Turk-Sib Railway in 1930 brought rapid growth, and the population rose from 46,000 in 1926 to 221,000 in 1939. A number of food and light-industrial factories were built, and heavy industry, particularly machine building, developed later on the basis of plants evacuated from European Russia during World War II. After Kazakstan obtained its independence from the Soviet Union in 1991, the city's name was changed from its Russian form, Alma-Ata, to its Kazak form, Almaty. In 1994 the government decided to gradually transfer the national capital from Almaty to Aqmola (since 1998 Astana) in the following years. The capital was officially moved to Aqmola in 1997." "The city is located in an area of extensive geologic risk, being subject to both earthquakes and mud slides. The city suffered from severe earthquakes in 1887 and 1911, and a mudflow down the Malaya Almaatinka River in 1921 caused considerable destruction and loss of life. To reduce the risk of future mud slides, an artificial landslide was precipitated by explosives in 1966 to dam a nearby gorge; the 330-foot (100-metre) dam that resulted proved its worth in 1973 by holding back a potentially catastrophic mud slide. Later improvements have raised the dam to 460 feet (140 m) and further improved the security of the city." "Almaty is now a major industrial centre, with the food industry accounting for about one-third of its industrial output and light industry for about one-fourth. There are a number of institutions of higher education, including the Kazak Al-Farabi State University (founded 1934), and teacher-training, economics, polytechnic, agricultural, and medical institutes. The city also houses Kazakstan's Academy of Sciences and its many subordinate research institutes, numerous museums, an opera house, theatres producing in Russian, Kazak, and Uighur, and the Pushkin State Public Library. Almaty also has a botanical garden, a zoo, and several stadiums." "Almaty now extends about 12.5 miles (20 km) in all directions from its centre and is considered one of the most beautiful cities of Kazakstan, with regular planning, wide, tree-lined streets, numerous parks and orchards, and a backdrop of mountains. The former Ascension Cathedral, built in 1907 and the second highest wooden building in the world, now houses a museum. Of the population, Russians and Kazaks constitute the largest majorities, with the remainder made up chiefly of Ukrainian, Uighur, Tatar, and German minorities." From the Encyclopaedia Britannica . Information about Almaty has a list of hotels, attractions, tours, restaurants, etc. Mayor of Almaty not in English yet, but a few pictures. Almaty Guide : info for tourists, walks over the city, what's good to view, outskirts, hotels, new names (renamed streets), geography (incl. 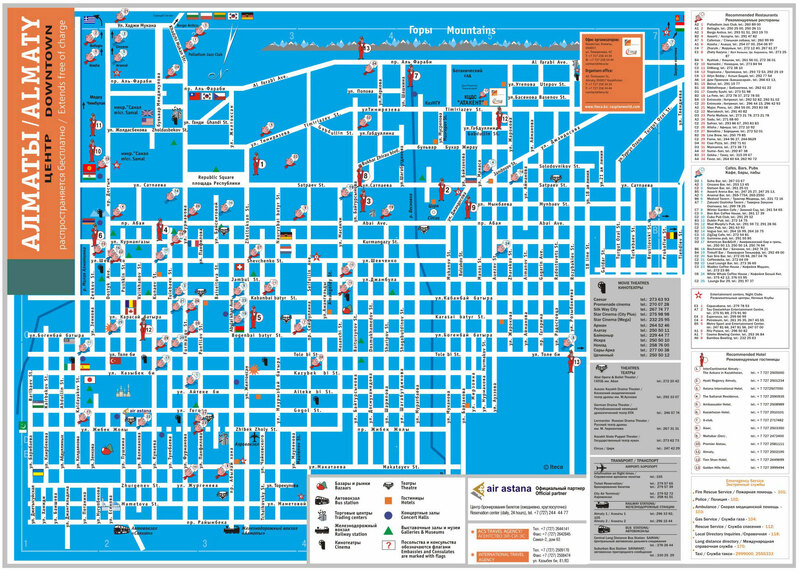 map of Almaty), photo album. Many of the Personal websites have pictures and information about Kazakhstan. There are only 2 tram routes left open, due to the construction of the underground metro system (site in Russian and Kazakh); there is an English guide with a little information and a map. Alexey's pictures from area around Almaty. Almaty and Vicinities Photoalbum has numerous pictures of Almaty; you can even order them on a CD. Almaty Yesterday and Today has pictures, history, etc. In Russian. Nikolay Orthodox Cathedral in Almaty, site in Russian. Yahoo Group: Almaty is for parents whose kids came from Almaty or are planning to adopt from there. Info Pack for guests . From Kazakhstan Institute of Management, Economics, and Strategic Research (KIMEP); offers undergraduate and graduate programs to international students. Pictures from the Sanda Family , a Japanese family living in Almaty. Almaty area webcam : Republic Square, Chimbulak and Kok Tobe. Search for Almaty on Youtube. Kazakhstan Orphan Video from Almaty in 2006. Almaty - the best city in the world. Almaty - the best city in the world 2. Aboutkazakhstan.com : lengthy list of hotels, population, city flag and coat of arms, map, history, and pictures. Travel blogger spent a week in Almaty and has several posts with pictures. Be sure to read her comparison between Almaty and Astana. Almaty - a personal food guide which describes shopping for food and restaurants. Individual hotels are listed in alphabetical order. Please note that these are very old reviews, go to Trip Advisor or other sites to find more recent reviews and newer hotels. I am removing links rather than trying to track down the current websites. Premier Alatau (105 Dostyk): 83 rooms and suites, suites and second floor rooms have air conditioning, phone, TV, phone, restaurant, lobby bar, cafe, laundry service, VIP service, gift shop. Almaty Hotel: 200 single/double rooms and suites, breakfast buffet included. Restaurant, bar, cafe, laundry, souvenir shop, sauna. Ambassador: 55 single/double rooms, breakfast buffet included, air conditioned, mini bar, hair dryer, laundry service, TV, restaurant, room service, coffee shop. Astana International Hotel: 114 single/double rooms and suites, air conditioned, phone, TV, hair dryer, mini-bar, breakfast and sauna included, restaurant, cafe, 2 bars, laundry service, business center with internet access, shop. "July 2003, $120 for suite with mini bar, private bath with tub and shower, hairdryer, room service, air conditioned and heated, phone, restaurant, bar/lounge, English, elevator, gift shop, beauty salon, internet access, accepts credit cards, walking distance to shopping, 'The hotel offered us an adoption discount via e mail before we went which amounted to a 40.00 per night discount for a suite. However, I was required to stay longer than expected due to court delays and was told I must leave after 30 days.' "
"February 2006; I stayed in a suite. It was nice, but a little pricey. I got an adoption rate of $179 per night. The room had a seperate bedroom and a living room with a wet bar. I had them remove the liquor so that I could put snacks and soda inside. There was 2 bathrooms which I really didn't need, but I was there for a week and did want the 2 seperate rooms. There was high speed internet access in the room which was inexpensive, room service, and laundry service (which was a little pricey). They have a nice restaurant in the lobby and a second, more casual restaurant downstairs. There is also a small gym, a hair salon and gift shop. The staff speaks English which I liked because I was there alone with my daughter. It's also within walking distance (2 blocks) of a big indoor mall with a supermarket, and around the corner (about 4 blocks) from another mall with clothing stores and a food court that had a big ball room for kids to play in. Atakent (E10): 35 rooms, TV, minibar, telephone, Korean restaurant, bar, cafe, pool, sauna, beauty palor, shop, room service. Beijing Hotel: 18 single and double rooms, air conditioned, TV, phone, restaurant, lobby bar, laundry service. Hotel Dostyk is a beautiful older hotel. 99 single/double rooms and suites, air conditioned, room service, phone, TV, hair dryer, mini-bar, restaurant, pub, bar, business center, beauty parlor, sauna, laundry services. Nice lobby shop. Eurasia (G9): "May 2006, $158/night for 1 adult, private bath with tub, shower, hairdryer, refer, air conditioned, heat, phones, TV, restaurant, staff speaks English, elevator, accepts credit cards, walking distance to shopping. In Building that contains a mall shopping area. Right down the street from Ramstore a large Western type mall." Holiday Inn: 228 rooms, accepts all credit cards, mini bar, coffee maker, internet access, hairdryer, ice machines!, room service, restaurant, bar. Hyatt Regency: 292 rooms and suites, air conditioned, telephone, TV, hairdryer, mini-bar, 2 restaurants, bar/lounge, room service, spa and fitness center, business center with interet access, beauty salon, laundry service, VIP service at airport, babysitting, gift shop. Hotel Kazakhstan: Tallest building in Almaty, with excellent views from their top floor restaurant. 364 single/double rooms and suites and apartments, phone, TV, mini-bar, business center with internet access, drug store, hair salon, newsstand with English newspapers. Nice gift shop, sometimes stocks an English guide to Almaty. "June 2003, $83 for standard room for 2 adults and 1 child, private bath with tub and shower, room service, heated, phones, TV, Kazakh restaurant, bar, staff spoke English, elevator, gift shop, beauty salon, internet access, takes credit cards, walking distance to shopping. Nice buffet breakfast included in room rate. The restaurant was poor - we ate there once only. The hotel is within a block or two of several restaurants that are much better. The staff was great for the most part - very helpful and kind to our daughter. Room rate for 2 adults, 1 child was $91.00. The view from our window was fantastic - overlooked the mountains. The windows could both be opened for ventilation. The Ramstor is within walking distance; if a cab is preferred it cost only 300 tenge ($2.00)." Intercontinental Hotel: Formerly the Regent Ankara; 290 rooms and suites, phone, TV, hair dryer, mini-bar, 2 restaurants, cafe, bar and lounge, laundry service, newsstand, business center with internet access. Kazgol, Kazzhol guest house catering to adoptive families. From an adoptive parent: "We paid $65 a night, a breakfast coupon was included (a Kazakh breakfast), the maids cleaned every day. There is a laundry on the bottom floor that is inexpensive. You can rent a VCR for about $2 a day and videos. We bought a few for Borya in Russian and they have some for rent in English. They have their own Internet connected computer that is about $3.50 an hour. We felt safe here, they lock the front door at night. Most of the folks who work there speak some English. If you decide to stay here ask for a room on the back. We were on the main street and it was noisy late at night. This is sort of a residential area. You can also ask for air conditioning if you need it. We had a fan in July and it was hot. They also have western style mattresses." "May 2003, $55 for standard room with 1 queen bed, private bath with tub and shower, hairdryer, refridgerator, mini bar, air conditioning and heating, phones, TV, crib available, 1 restaurant, lounge, staff spoke English, hair salon, internet access, walking distance to shopping. This was a superb hotel for what we had been through already. It had awesome internet acess with long hours that they were open. Super nice staff, clean rooms, balconies, clean bathrooms, very good housekeeping. Our trip would not have been as bearable if this hotel wasn't so good. One block to stuff you need." March 2004, $32/night. Private bath with shower, refer, air conditioned, heat, phones, TV, crib, restaurant staff speaks English, salon, internet access, accepts credit cards, walking distance to shopping. "This hotel has outdated decor and modest accomodations, but is safe and clean. Budget prices!! Breakfast included in price (hard boiled eggs, granola, yogurts, some fruit, hot water with coffee and tea packets, and some ethnic dishes). There are 4 floors and no elevator. The single room I was in had a tiny bathroom, but I heard the suites were much more spacious. The bedding and towels were plentiful. There is a "Business Center" that has 2 computers with fairly-high speed internet service (cost for Internet use: approx. $2.50 per hour - this is more than most Internet-access places charge, but it was very convenient to have it located right in the hotel). Front desk spoke fluent English. Within 4 blocks of the hotel are markets, drugstores, and the Tsum Mall (top two floors of the Mall are filled with 100+ booths selling a multitude of Kazakhstan and Russian souveniers and collectibles). This hotel was ideal for spending my final week (processing-out at the Embassy, etc) in Kazakhstan." Contact Marcia for more. March 2001 and 2002, $55-60 per night. Private bath with tub and shower, mini bar, heat, phones, TV, restaurant staff speaks English, internet access. "Hotel Kaezhol is an ideal hotel for those budget conscious adoptive parents coming and going through Almaty to and from other parts of the country who have one or more days to spend in Almaty. It was in what seemed a residential area on a side street that was fairly quiet. It is comfortable, clean, has adequate sized western style rooms with private baths. We had tubs and showers and daily maid service. Suites had a resonably sized sitting room with a pull out double bed to accompany the double or queen sized bed in the bedroom. There was TV and a minibar frig which we used for food and drinks we bought and brought back to the hotel. In the basement was a small restaurant which served breakfast that was included in the price of the room. In the back of this area was a two station Internet cafe which cost about $3 per hour use. It is very well located, being 4 easy walking blocks to Tsum and the walking street closed to traffic with fun street life, such as painters and sketchers of people for about $5 getting good quality drawings of your kids. We purchased several Kazakh paintings from the street artists. Some are excellent and well priced. Tsum has most of what you might want, including a third floor area of shops with Kazakh souveniers where we liberally stocked on things to bring home as gifts and for our children to remember. Tsum is multiple shops in one multistore building. I suppose they exist in most larger towns, as there was one in the center of Karaganda as well. To my amazement, there was a Baskin Robbins right beside Tsum in Almaty. Nine blocks walk (15 - 20 minutes) is the wooden cathedral known as the largest such wooden building made completely without nails. There is an interesting monument on the far end to those who sacrificed during WWII and very near is the interesting Kazakh music museum. Our guide actually played some traditional Kazakh music on some of the instruments for us. It was difficult to find traditional Kazakh music for purchase, so bought some tapes there. The very interesting outdoor market and food stall markets (animal carcasses hanging from large hooks) is about two blocks to the north, behind the Hotel Otrar. In summary, while you can have a very upscale $300/night room in Kazakhstan, we were totally satisfied for what we got for about $60/night for a suite the the Hotel Kaezhol. It would be less for a regular hotel room and even less (about $30) for a single. Both times there, it was in the dead of winter but was very comfortable regarding temperature without a wall thermostat that I can recall. I don't recall whether it had air conditioning units. The personel staffing the front desk were friendly and spoke adequate English to understand. You could pay with a credit card. We felt safe. There was a hotel male employee at the door at all times it seemed. It doubt you will find better in Almaty for the price". Contact Greg if you think he left any details out! December 2005, $110/suite/2 people, private bath with tub, shower, refer, mini bar, heat, phones, crib available, Kazakh restaurant, staff speaks English, elevator, internet access, accepts credit cards, walking distance to shopping. "We stayed at the Kazzhol for one night when we first arrived. It was a small but pleasant enough room, with a bed that was very comfortable after the long plane trip. The second trip to Kazakhstan, we started in the Hyatt but decided after a couple days it was simply not child-friendly enough. For the same amount of money we got a suite at the Kazzhol. It was spacious, clean, very comfortable, and made the stay in Almaty for a week very home-like. There was an elevator. It had a refrigerator, a great bathtub and shower, and there was room for the kids to play. The furniture did not seem as fragile (or fancy) as at the Hyatt, and it withstood kids climbing on it well. We ate at the restaurant every morning and evening, and they were courteous and helpful. I used the business center a fair amount and that was also extremely useful for sending emails and updating the blog. Best of all, it was within walking distance of lots of fun places--especially the pedestrian mall outside the Tsum. Even in the winter it was pleasant with artists and street musicians. And in other directions were grocery stores, shopping of all sorts, and parks. It was a lot more fun than the Hyatt." Munaishi: 20 rooms, breakfast included. From an adoptive parents: "Aug/Sept 2002. It was about $70 per night. We were relatively close to BH #3 where our son was. It was also right around the corner from a Kazak restaurant we really liked. It certainly wasn't nice by our standards here in the US but we made it fine. They had a laundry service that appeared to cost about $1 per piece. Although we handwashed most things we did utilize their service a couple of times. The nightly rate also included breakfast. I think it was 6 stories tall. The restaurant was on the 6th floor. They did have an elevator. The air conditioning didn't really work well so we bought a fan while we were there. We slept fine after that. We also kept the window open a lot. It had a refrigerator and television. There was VERY little on television though. I highly recommend taking a laptop with DVD or a portable DVD with you if you can. It really saved us after we had read everything we had brought with us. We also had twin beds we had to push together. They had the firmest mattresses I have ever slept on. I got a little sore toward the end of the stay. So, in closing, I will say it wasn't an elegant hotel but it was inexpensive, relatively clean, the people were nice, and the breakfast (particularly the cold Pepsi) was pretty good." Hotel Otrar: air conditioned, phone, TV, mini bar, restaurant, room service, gift shop, coffee shop, pool, laundry service. Radisson SAS hotel, Medeu: opening late 2011, near Medeu and Chimbulak skiing area, 134 rooms, free wireless, "Almaty's first resort hotel". Sonar (? E7 or E8): 32 rooms and suites, air conditioning, TV, blow dryers, refrigerators, restaurant, bar. From an adoptive parent: "It was okay - we had a suite (living room, bedroom and bathroom) for $44 a night which included breakfast (which wasn't bad). I believe the regular room was about $35. I felt safe there and it was fairly clean and had daily housekeeping service. Well - my mom found a condom in the crease of the sofa - but hey, it was still wrapped! They have room service - but I had to have my translator call it in. They also took Visa. The drawback was they had no cribs - but we made due." From another adoptive mom: "October 2002, $44.00, room type = double, 2 adults and 1 baby, private bath with tub and shower, hair dryer, refer, room service, air conditioned, phones, TV, 1 restaurant with Russian/Kazakh food, hair salon, takes credit cards. There was an air conditioner - but it didn't work. Also - I had room service, but my translator ordered in down in the restaurant and they delivered it to the room. There was also laundry service and daily housekeeping. It was clean and comfortable. There was not really a gift shop, per se, but a little shop that sold water, soda, snacks and any grooming items you might need. I'm not sure about walking distance to shops, etc as our translator wouldn't allow us out without her. Overall - I was satisfied with my stay, but I was only there 3 nights." "December 2001, private bath with tub and shower, hairdryer, refridgerator, AC and heat, phone, TV, kitchenette, restaurant, bar, elevator, walking distance to shopping, 'Not a luxury hotel by any means, but liveable. Cleanliness was okay, not great, tacky plush furniture, kitchenette stocked with a few plastic dishes and plenty of Cokes since Coke bottling plant is across the street. No cribs (still wonder why adoption agencies use a hotel that will not provide cribs?) had to make do by pushing furniture against wall and making baby beds with extra linens. Have heard of some families using a suitcase for this. Staff did not speak much English, housekeepers were the best - when they saw we had babies we had fresh clean linens every day. Small grocery store about 2 blocks away, we bought juice, formula (only German brands), paper products, diapers etc.' "
Tan Sholpan (C11-D12): "May 2003, $35 for standard room with 2 single beds, private bath, air conditioning, no restaurant, elevator. The place looked like a bomb went off....it was in horrible condition. There was a tv, but it didn't work. The floor was super stained. The shower was only half supported underneath and you had to step up two feet to get into it. There was an elevator, but it could only fit three small adults. I didn't see a restaurant, but we stayed there only about five hours and then left." Uyut (F7): 74 single/double rooms and suites, phone, TV, refrigerator, cafe, laundry. Zhamzhirak (E7): From an adoptive mom - "$40/night (2003), 2 room suite and large private bathroom with tub/shower, refrigerator available, TV, sofa, 2 comfortable chairs, large coffee table, good food in the restaurant $1.50 for a hearty meal, across the street from a large market and the Russian Orthodox church, plenty of food and bottled water close by, address: Baytursinova 65a." Zhetysu: 260 rooms, cafe, restaurant, internet access, hairdresser, laundry, phone, TV, regrigerator, breakfast included.